Like his predecessor, Otto III, he had the literary education of his time. In his youth he had been destined for the priesthood. Therefore he became acquainted with ecclesiastical interests at an early age. Willingly he performed pious practices, gladly also he strengthened the Church of Germany, without, however, ceasing to regard ecclesiastical institutions as pivots of his power, according to the views of Otto the Great. With all his learning and piety, Henry was an eminently sober man, endowed with sound, practical common sense. He went his way circumspectly, never attempting anything but the possible and, wherever it was practicable, applying the methods of amiable and reasonable good sense. This prudence, however, was combined with energy and conscientiousness. Sick and suffering from fever, he traversed the empire in order to maintain peace. At all times he used his power to adjust troubles. The masses especially he wished to help. The Church, as the constitutional Church of Germany, and therefore as the advocate of German unity and of the claims of inherited succession, raised Henry to the throne. The new king straightway resumed the policy of Otto I both in domestic and in foreign affairs. This policy first appeared in his treatment of the Eastern Marches. The encroachments of Duke Boleslaw, who had founded a great kingdom, impelled him to intervene. But his success was not marked. In Italy the local and national opposition to the universalism of the German king had found a champion in Arduin of Ivrea. The latter assumed the Lombard crown in 1002. In 1004 Henry crossed the Alps. Arduin yielded to his superior power. The Archbishop of Milan now crowned him King of Italy. This rapid success was largely due to the fact that a large part of the Italian episcopate upheld the idea of the Roman Empire and that of the unity of Church and State. On his second expedition to Rome, occasioned by the dispute between the Counts of Tuscany and the Crescentians over the nomination to the papal throne, he was crowned emperor on 14 February, 1014. But it was not until later, on his third expedition to Rome, that he was able to restore the prestige of the empire completely. Before this happened, however, he was obliged to intervene in the west. Disturbances were especially prevalent throughout the entire northwest. Lorraine caused great trouble. The Counts of Lutzelburg (Luxemburg), brothers-in-law of the king, were the heart and soul of the disaffection in that country. 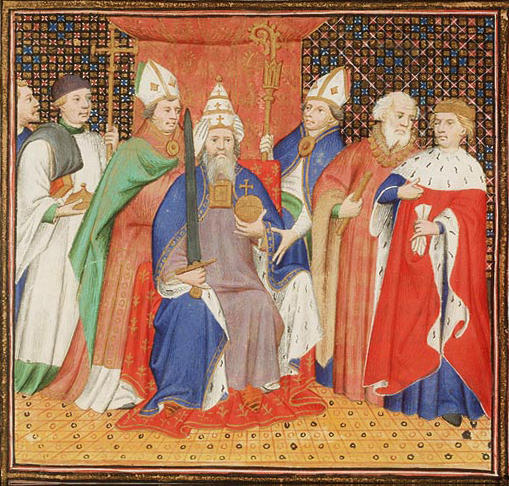 Of these men, Adalbero had made himself Bishop of Trier by uncanonical methods (1003); but he was not recognized any more than his brother Theodoric, who had had himself elected Bishop of Metz. True to his duty, the king could not be induced to abet any selfish family policy at the expense of the empire. Even though Henry, on the whole, was able to hold his own against these Counts of Lutzelburg, still the royal authority suffered greatly by loss of prestige in the northwest. Burgundy afforded compensation for this. The lord of that country was Rudolph, who, to protect himself against his vassals, joined the party of Henry II, the son of his sister, Gisela, and to Henry the childless duke bequeathed his duchy, despite the opposition of the nobles (1006). Henry had to undertake several campaigns before he was able to enforce his claims. He did not achieve any tangible result, he only bequeathed the theoretical claims on Burgundy to his successors. Better fortune awaited the king in the central and eastern parts of the empire. It is true that he had a quarrel with the Conradinians over Carinthia and Swabia: but Henry proved victorious because his kingdom rested on the solid foundation of intimate alliance with the Church. That his attitude towards the Church was dictated in part by practical reasons, primarily he promoted the institutions of the Church chiefly in order to make them more useful supports his royal power, is clearly shown by his policy. How boldly Henry posed as the real ruler of the Church appears particularly in the establishment of the See of Bamberg, which was entirely his own scheme. He carried out this measure, in 1007, in spite of the energetic opposition of the Bishop of Wurzburg against this change in the organization of the Church. The primary purpose of the new bishopric was the germanization of the regions on the Upper Main and the Regnitz, where the Wends had fixed their homes. As a large part of the environs of Bamberg belonged to the king, he was able to furnish rich endowments for the new bishopric. The importance of Bamberg lay principally in the field of culture, which it promoted chiefly by its prosperous schools. Henry, therefore, relied on the aid of the Church against the lay powers, which had become quite formidable. But he made no concessions to the Church. Though naturally pious, and though well acquainted with ecclesiastical culture, he was at bottom a stranger to her spirit. He disposed of bishoprics autocratically. Under his rule the bishops, from whom he demanded unqualified obedience, seemed to be nothing but officials of the empire. He demanded the same obedience from the abbots. However, this political dependency did not injure the internal life of the German Church under Henry. By means of its economic and educational resources the Church had a blessed influence in this epoch. But it was precisely this civilizing power of the German Church that aroused the suspicions of the reform party. This was significant, because Henry was more and more won over to the ideas of this party. At a synod at Goslar he confirmed decrees that tended to realize the demands made by the reform party. Ultimately this tendency could not fail to subvert the Othonian system, moreover could not fail to awaken the opposition of the Church of Germany as it was constituted. This hostility on the part of the German Church came to a head in the emperor's dispute with Archbishop Aribo of Mainz. Aribo was an opponent of the reform movement of the monks of Cluny. The Hammerstein marriage imbroglio afforded the opportunity he desired to offer a bold front against Rome. Otto von Hammerstein had been excommunicated by Aribo on account of his marriage with Irmengard, and the latter had successfully appealed to Rome. This called forth the opposition of the Synod of Seligenstadt, in 1023, which forbade an appeal to Rome without the consent of the bishop. This step meant open rebellion against the idea of church unity, and its ultimate result would have been the founding of a German national Church. In this dispute the emperor was entirely on the side of the reform party.